The U.S. Consumer Product Safety Commission (CPSC) estimates that approximately 2,200 injuries associated with extension cords are treated annually in hospital emergency departments. The CPSC also estimates about 5,000 residential fires originate from extension cords each year, killing 85 persons and injuring some 230 others. The most frequent causes of such fires are short circuits, overloading, damage, and misuse of extension cords. About half the injuries involve fractures, lacerations, contusions or sprains caused by tripping over extension cords. About one of every four injuries involves children less than five years of age; electrical burns to the mouth account for half the injuries to young children. • Use extension cords only when electrical power is needed in a remote location for a short time period such as: drilling a hole, running the weed whacker, using a projector. It’s important to use extension cords only for short temporary periods. • Use polarized cords for safety. One of the prongs is wider than the other, preventing the plug from being inserted incorrectly. 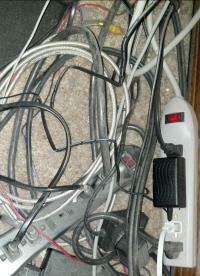 • Make sure cords do not dangle from counters and table tops where they can be pulled or tripped over. • If cords lack safety closures, cover any unused outlets with electrical tape or with plastic caps to prevent a child from making contact with the live circuit. • Insert plugs fully so that no part of the prongs is exposed when the extension cord is in use. • Discard any old, cracked, worn, or damaged extension cords. Replace cords which show signs of possible short circuiting. • When disconnecting cords, pull the plug rather than the cord itself. • Teach children not to play with plugs and outlets. • Use only 3-wire extension cords for appliances with 3-prong plugs. Never remove the third round or U-shaped prong safety feature designed to reduce the risk of shock or electrocution. • Inspect locations frequently where furniture or beds may be moved against a wall and the electrical cord where it joins the plug. “Angle extension cords” are available for these instances. • Check the plug itself and the receptacle body of extension cords when they are in use. Noticeable warming of these plastic parts can be expected when cords are being used at their maximum rating; however, heating to hot temperatures or softening of the plastic is a warning that the plug wires or connections are failing and that the extension cord should be discarded and replaced. • Using an extension cord while it is coiled or looped can generate a lot of heat–always stretch out the entire cord. Covering any part of an extension cord with newspapers, clothing, rugs or any object while it is being used should always be avoided. Always place an extension cord where it will not be damaged by heavy furniture or foot traffic. • Extension cords are not designed to be attached to building surfaces in a permanent manner (staples or nails) as this could damage the cord and present a shock or fire hazard. • Plugging in too many appliances in a single extension cord can overload the cord and cause a fire. Use extension cords that fit the job. Use a heavy-duty cord if you have any doubts. • Use special, heavy-duty extension cords for high wattage appliances such as air conditioners, portable electrical heaters and freezers. • When using outdoor tools and appliances, use only extension cords labeled for outdoor use.